Urban environments can be a stressful place for trees to grow. So newly planted trees need special care to help them be healthy and grow to maturity. Mulching and watering trees is an easy way to care for your trees. Newly planted trees need 15-25 gallons of water once a week for the first 3 to 5 year when the ground is thawed. You can skip watering if it has rained more than 1 inch in a week. Weekly watering sound expensive but costs less than a cup of coffee. Mulch that cover a trees roots provides numerous benefits. It keeps the roots cool and moist in the summer. It protects tree roots from freezing in the winter. Mulch adds nutrients and organic matter to the soil, and reduces competition with weeds. Mulch also keeps weed whips and lawn mowers away from a tree's trunk. Trees should be pruned when they are young so they grow strong branch attachments and good structure, which reduces damage a tree experiences during storms. Proper pruning techniques speeds up the time a pruning wound heals and decreases the formation of rot in a tree. 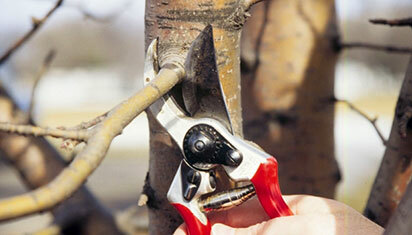 Consider hiring a trained tree care professional to prune your trees.